Promoted as a target arm, the Scorpion is also a versatile hunting handgun. It is certainly accurate enough to please the most discriminating shooter. Starting out in 1974 as “Tom’s Gun Bluing,” Tom Volquartsen has built “Volquartsen Custom” into a world leader when it comes to engineering advanced, high-tech, highly stylized rimfire pistols and rifles as well as custom parts for upgrading and accurizing standard Ruger models like the MkI, MkII and MkIII. Annually, the Volquartsen exhibit at the SHOT Show is a show-stopper because of the range of firearm artistry on display. If you don’t catch them at the show, the current Volquartsen catalog and website are as equally visually stimulating. Volquartsen’s products are simply unique, and the family-owned company is a delight to work with. For the past month, I have been shooting their “Scorpion” model pistol. The experience has been a revelation. I can’t recall ever shooting a rimfire pistol exhibiting such consistent accuracy with such a smorgasbord of loads and ammunition brands. It really spoils you when you can grab practically any box of .22 LR, haul off to the range and consistently shoot dime-sized groups at 25 yards. 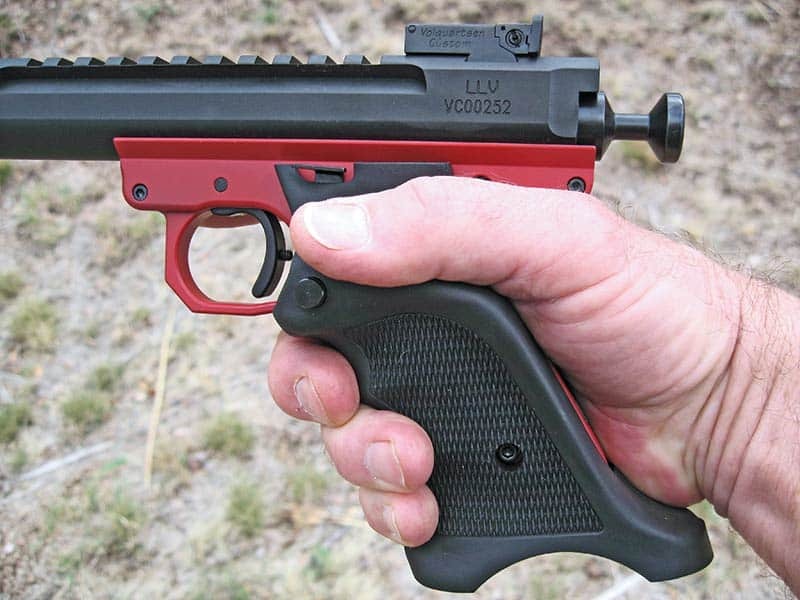 The Scorpion is rated as Volquartsen’s ultimate lightweight target pistol. Frankly, I didn’t choose the Scorpion based on its weight but on the basis of its unique design and combination of custom features I liked. With a 4.5-inch barrel and lightweight grips, it will tip the scale ever so lightly at 1 pound, 12 ounces. On the other hand, I selected a 6-inch barrel with a compensator installed and the company’s large, hand-filling, Volthane target grips. That combination brought the weight of the test pistol up to 2 pounds, 7 ounces which is still 1 ounce lighter than my stock MkII Ruger target pistol with a 6.875-inch barrel. The Scorpion, like many other Volquartsen pistol and rifle models, is built entirely in-house, using state-of-the-art CNC and wire EDM machinery. It is built around two sub-assemblies Volquartsen also offers separately to the public—a VC Target Frame and an LLV Competition Pistol Upper. Holt selected a 6-inch barrel with a compensator installed and the company’s large, hand-filling, Volthane target grips bringing the weight of the test pistol to a well-balanced 2 pounds, 7 ounces. With a hard-anodized finish, the frame is available in red, blue, OD green and black, or in silver which is a nickel-boron (NiB) coating. The red anodized frame of my Scorpion, mated with its black upper, is simply gorgeous and a consistent head-turner at the range. The choice of grips offered to complete the lower frame should satisfy anyone. There’s the Volthane target grip pictured here, a laminated wood target grip (which in a red/black laminate would really look cool on my Scorpion), an aluminum grip and a Hogue Monogrip. The target grips are only available for the MkIII-type frame. 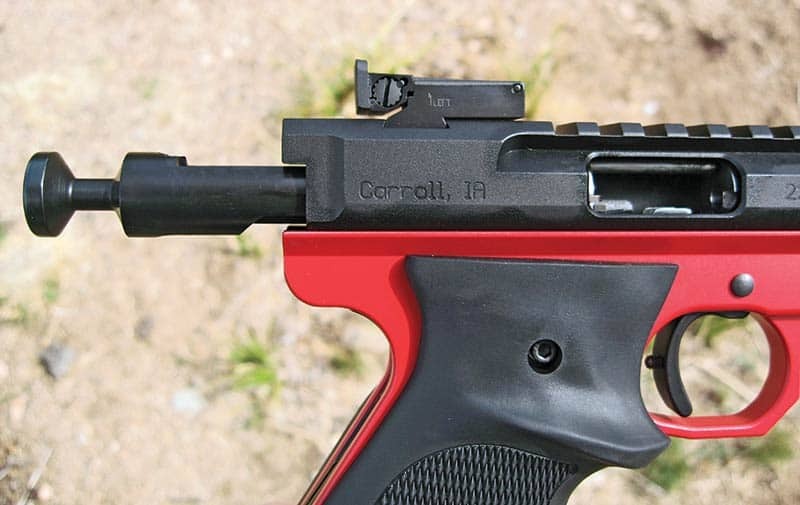 The second sub-assembly is Volquartsen’s LLV Competition Pistol Upper or barreled receiver. The receiver and barrel shroud are machined in-house from a billet of aluminum alloy. The shape of the receiver is slab-sided with a rounded underbelly. A very useful Picatinny rail is machined integral with the receiver providing a mounting surface for optical sights. I also opted to have a set of Volquartsen’s conventional target sights mounted on the receiver to conform to any match requirements. The Scorpion’s 4.5- or 6-inch stainless steel barrel is machine-honed and lapped and threaded at the muzzle with a 1/2×28 thread form for conveniently mounting a Volquartsen-designed compensator or simply a thread-protecting barrel nut. Rounding out the receiver assembly is Volquartsen’s competition bolt fitted with an improved firing pin, spring and extractor, plus it’s machined with a handy integral, extended bolt-racker knob. Why Ruger hasn’t gotten around to a similar bolt racking design befuddles me. The upper receiver is offered in two colors: anodized black or silver NiB coated. How does the Scorpion perform? The overall balance of the Scorpion in your hand with a 6-inch barrel, compensator and Volthane target grip is sensational. The weight distribution made possible through the extensive use of aluminum and a light, contoured barrel is just about perfect. Delivering 5-shot groups at 25 yards as small as 0.45-inch, the Scorpion is superbly accurate. 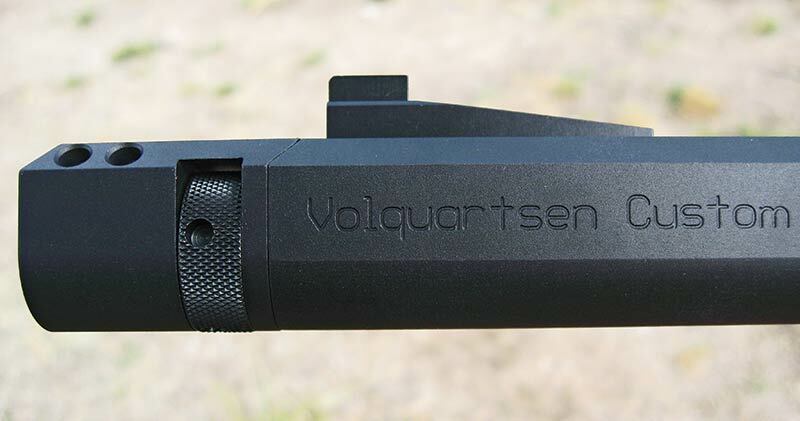 Volquartsen’s removable compensator is a real plus in eliminating muzzle flip. When on target, the Scorpion just hangs there in your hand, giving you the opportunity to focus intently on your sight picture and trigger release. To help me better wring out the accuracy potential of the Scorpion, Leupold supplied their fine FXII 4x28mm pistol scope and a set of quick detachable, high (0.98-inch) rings. I thought the combination would be the perfect match. It proved not to be. The high rings were too low to clear the ocular bell from the top of the target sight, even when the target sight was wound down to its lowest setting. I ended up shimming the rear of the scope tube in a set of very high Weaver rings to enable me to use the Leupold for the test. Having gone through that little exercise, a red dot or reflex-type sight would be the recommended solution for mounting an optical sight on the Picatinny rail of the Scorpion. From the standpoint of accuracy, the Scorpion left nothing to be desired. It’s a pistol that shoots like a rifle. The dime-sized, 25-yard groups pictured are confirmation. Not only were the test groups pleasingly minute, but the points of impact of six different rimfire loads varied very little. Eley Target ammunition was the class winner with a 5-shot group measuring only 0.45-inch, but moderately priced Federal Champion target and CCI Quiet HP hunting rounds turned in remarkable performances delivering 0.66- and 0.68-inch size groups respectively. The groups speak volumes about the overall quality and tight tolerances built into Volquartsen products. and aid in natural pointing. I liked the Volquartsen compensator. Sound levels went up a bit, but the muzzle stayed down as it should. The compensator is held in place by a removable barrel nut. A muzzle nut removal tool is included with the cased Scorpion, giving the owner the option of using the compensator or not. The 2.25-pound trigger with its adjustable stop screw was light, crisp, easy to master and a joy to use. 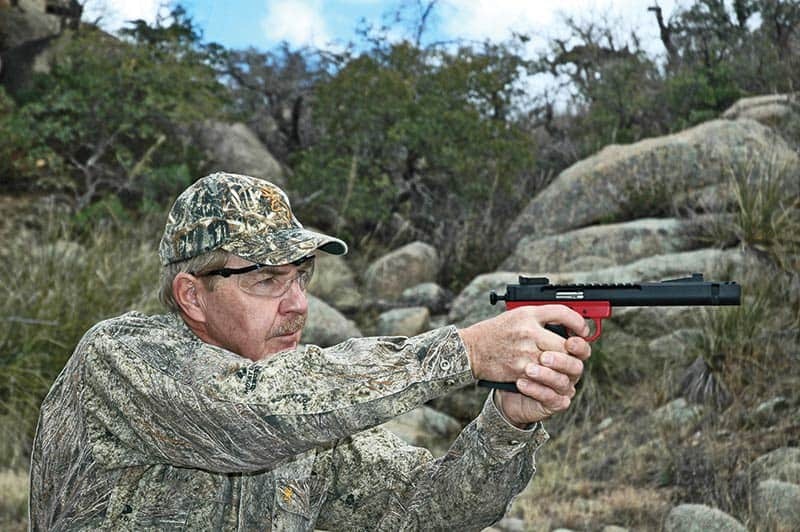 While it’s promoted as a lightweight, target pistol, given its outstanding accuracy, the Scorpion would be equally useful as a hunting handgun. 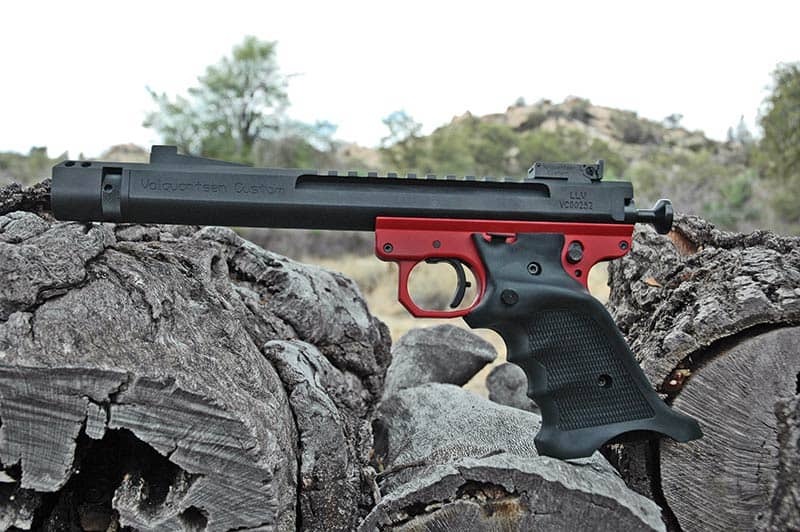 The Scorpion is just one of three totally Volquartsen-made rimfire pistols. Modifying and rebuilding brand new MkIII Rugers into 10 different, high performance configurations under the “Volquartsen Custom” label is the other side of the pistol business as well as offering shooters gunsmithing services and a complete line of owner-installed accuracy kits and parts to upgrade existing Ruger models to Volquartsen standards. Volquartsen’s rimfire rifle business tracks the pistol side of the shop with extensive lines of custom semi-auto, 10/22-type designs in .22 LR, .17 HMR and .22 WMR. For 2014, there is even a Volquartsen-made, semi-automatic chambered for the hot .17 Winchester Super Magnum. Now that’s something. Volquartsen products are not inexpensive, but true quality never is. This is a driven company—driven to make the best possible product throughout their extensive firearm lines. The Volquartsen family is succeeding in doing just that. 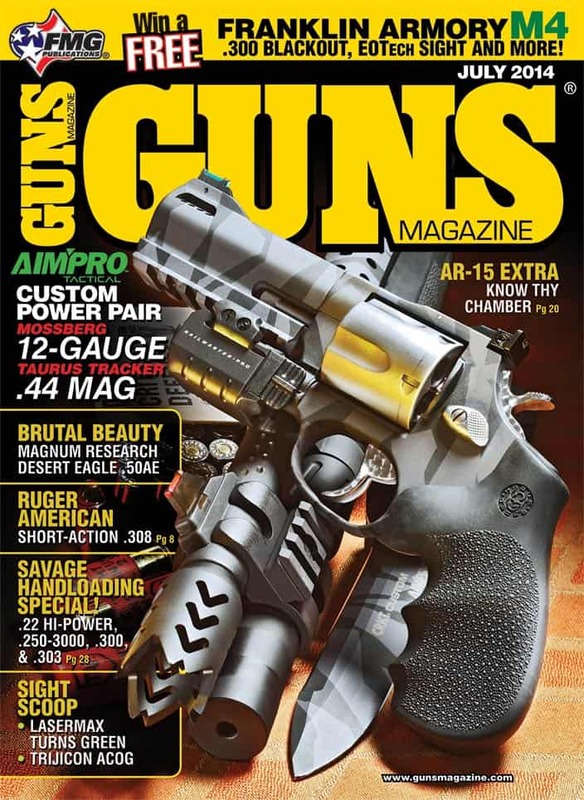 Purchase A PDF Download Of The GUNS Magazine July 2014 Issue Now!